ThingLink is a tool for creating interactive images by tagging content to a photo or drawing. Tags can link to websites, Facebook or Twitter pages, videos, maps, other images, audio, or google resources. Users can also create interactive videos with a professional or premium account. Interactive images can be shared on social networks, including Facebook, Twitter, Pinterest. There is an option to embed the Thinglink image on other websites as well. 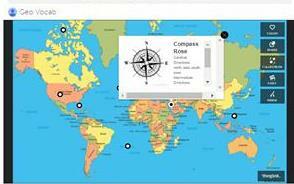 Another feature that Thinglink offers is 360 degrees tours with tags. Users can upload 360 degrees pictures and add audio and video tags for a 3D virtual reality experience. This feature is only available with a Professional or Premium subscription. Substitution: Interactive images can substitute linear PowerPoint presentations, educational videos, presentations, and posters. 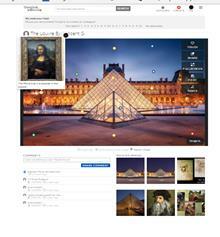 Augmentation: Creating interactive images can improve the processes of searching and curating online content. It can be used by students or teacher, students can show their products as an online portfolio, or use it as an aid for presentations. Modification: Pre-designed interactive images can be commented on, shared, and modified using the remix button. Redefinition: Mixing different modes of text, audio, and video provides an innovative experience in the classroom. 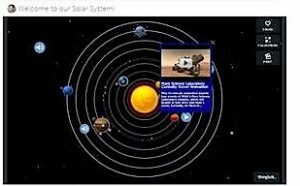 Thinglink can be especially useful for science, geography, history, language, and visual arts. English/Language Arts: Students can make their own vocabulary mind map and tag related words and images. Students can also annotate images of their favorite authors and texts. 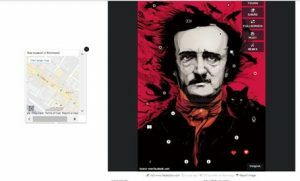 See an example in which the image links to the Edgar Allan Poe’s birthplace, major works, and related websites. Geography: Students can pinpoint names of places and landmarks. They can also include definitions or annotate historical facts on maps. Step 2. Sign up by creating an account using an email or sign up using your Facebook, Twitter, or Google account. Step 3. Explore or follow popular users or topics. Step 4. Upload an image from your hard drive, the Internet, or Facebook. Step 5. Select a position on the image and tag it to a website, video, or map. Step 6. Share your interactive image on Facebook, Twitter, Gplus or obtain a code to embed it in your website.